Born in London, Sydney Richard Williams (1821-1886) adopted the surname, Percy, to distinguish himself from his father Edward Williams and his five brothers, who were also painters. He was heavily influenced by his talented father, who provided the bedrock on which his skill was to flourish. He soon became both a successful and prosperous landscape painter, depicting scenes in Devon, the Lake District, North Wales and, latterly, Scotland. 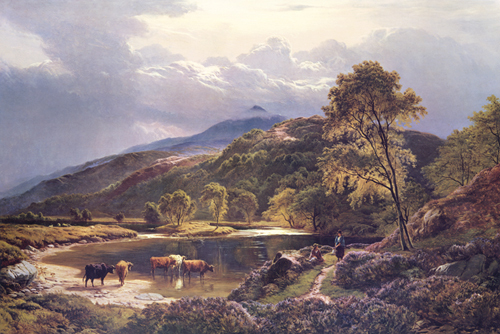 Rugged and raw landscapes of this kind met the demand of the wealthy middle-classes at this time and Percy was one of the most popular painters of the Victorian era. He often included local children or gypsies in his landscapes in order to emphasise the sheer magnitude of the nature he was depicting. Percy ranks amongst England's foremost landscape painters, and is he is also well known today as the founder of the Barnes School.